Mick Hanbury was born in Cyprus the son of a soldier, and traveled around europe for most of his childhood. He spent a lot of time in Germany and hence is fluent in German and can teach in German. He started his career as a cabinet maker where he made all manner of artifacts. Around 20 years ago he took to woodturning and since then has grown in stature to be one of the finest artistic turners. 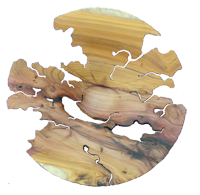 Mick Hanbury demonstrates at local and national shows in England, USA, Germany, and Ireland and at woodturning clubs throughout the UK. Mick used to be the resident tutor at Doncaster College teaching Open College Network levels 1-3 to mature students. Mick also teaches his specialised woodturning techniques in his workshop in Lincolnshire as well as at Craft Supplies (in the UK and France), and at Isaac Lord in High Wycombe, Buckinghamshire. Mick is happy to help you either start out on woodturning or to help you improve your techniques and learn new ones. He can teach you in your own workshop or in his well equipped workshop in Lincolnshire — see courses and rates. You can view pictures of Mick's woodturning in his portfolio and in Mick’s Work Art Gallery. If you would like Mick to demonstrate for you, to teach you, or to inspire you don't hesitate to contact Mick . Mick Hanbury also takes on commissions so contact him if there is something special you would like Mick to turn for you or your loved one.